In recording their follow-up, Blur (1997), the band underwent another reinvention, showing influence from the lo-fi style of American indie rock groups. “Song 2″, one of the album’s singles, brought Blur mainstream success in the United States. Their next album, 13 (1999) saw the band members experimenting with electronic and gospel music, and featured more personal lyrics from Albarn. In May 2002, Coxon left Blur during the recording of their seventh album Think Tank (2003). Containing electronic sounds and more minimal guitar work, the album was marked by Albarn’s growing interest in hip hop and African music. After a 2003 tour without Coxon, Blur did no studio work or touring as a band, as members engaged in other projects. In 2008 Blur reunited, with Coxon back in the fold, for a series of concerts and have continued to release several singles and retrospective releases. In 2012, Blur received a Brit Award for Outstanding Contribution to Music (And poor Adele Adkins got cut off in her prime). Steve Harris, from Awesomely noisy Heavy Metal band Iron Maiden was born 12th March 1956. 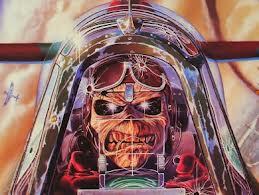 Iron Maiden hail from Leyton in east London and were formed in 1975 by bassist and primary songwriter, Steve Harris. Since their inception, the band’s discography has grown to include a total of thirty-six albums: fifteen studio albums; ten live albums; four EPs; and seven compilations. Considered one of the most successful heavy metal bands in history, Iron Maiden have sold over 85 million records worldwide with little radio or television support. The band won the Ivor Novello Award for international achievement in 2002, and were also inducted into the Hollywood Rock Walk in Sunset Boulevard, Los Angeles, California during their United States tour in 2005. As of August 2011, the band have played almost 2000 live shows throughout their career. For the past 30 years, the band have been supported by their famous mascot, “Eddie”, who has appeared on almost all of their album and single covers, as well as in their live shows. March 12th is World Day Against Cyber-Censorship, which aims to rally users in fighting repression of online speech. Reporters Without Borders also created this day to celebrate the work of brave individuals who have promoted free expression on the Internet. The annual Netizen Prize is awarded to bloggers, online journalists, and cyber-dissidents, who have demonstrated exceptional dedication to this cause. It was first observed on March 12, 2008 at the request of Reporters Without Borders and Amnesty International. A letter written by Jean-Francois Julliard, Secretary-General of Reporters Without Borders, and Larry Cox, Executive Director of Amnesty International, was sent to the Chief Executive Officers of Google, Yahoo! & Microsoft Corporation to request observation of the day. The Electronic Frontier Foundation remains dedicated to reporting cases of online censorship from all regions of the world, and to emphasize the importance of online anonymity in preserving individuals’ right to free speech. On our ongoing feature, This Week in Censorship, we cover global stories of imprisoned bloggers, filtered content, blocked websites, and instances of Internet disconnection. A broad array of reasons are offered as justification for censorship. Bloggers in Thailand face imprisonment for criticizing the monarch. In Pakistan, the Telecommunications Authority has blocked websites, banned words from SMS texts, and most recently, has released a request for proposals to build a national blocking and filtering system: All in the name of fighting “obscene content.” The Turkish government has implemented a so-called “democratic” opt-in filtering mechanism for content that is deemed unsuitable for children and families. I would like to get Suede’s sixth album which is called Bloodsports and sees the Britpop progenitors back on yelping, yearning form on an album which is full of thrilling `British rock highly charged with sneer and leers.